Patyegarang is a luminously beautiful work in its staging, its performance and the story it tells. 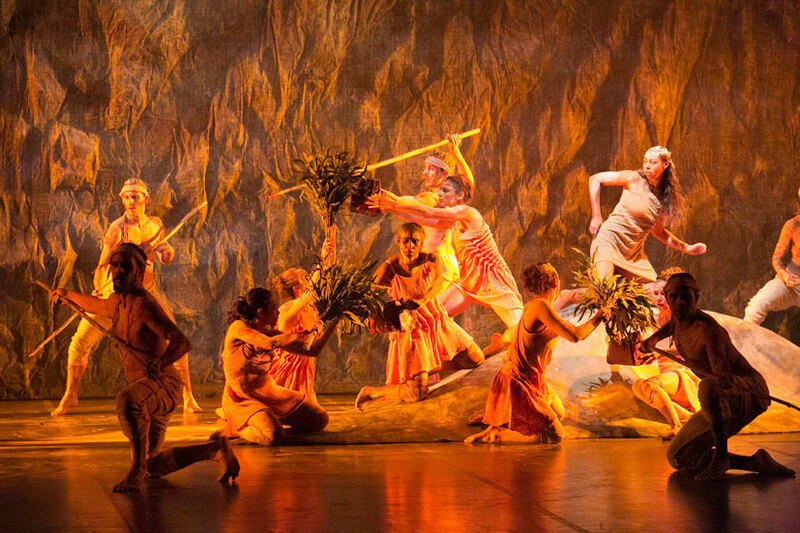 Choreographed by Stephen Page as the centerpiece of Bangarra Dance Theatre’s 25th anniversary year, it is the first Sydney story that the company has tackled – and what a fascinating “first contact” tale it tells. The inspiration was the relationship between Patyegarang, a 15-year woman of the Eora nation, and Lieutenant William Dawes, an astronomer, linguist and mathematician who arrived with the First Fleet and became the colony’s timekeeper. Patyegarang befriended Dawes and taught him her language and about her culture – which he detailed in his diaries, rediscovered at the University of London in 1972. In creating this 70-minute work, Page successfully avoids literal story telling. Instead the piece unfolds in haunting, almost dreamlike fashion through 13 scenes, which take different themes that evoke the spirit of the land and people before the arrival of the early settlers, their culture, the notion of time, conflict, intimacy, resilience etc. The choreography is lovely, combining the grounded traditional movement now so closely associated with the company with contemporary dance. The contrast between the movement for Dawes and the other indigenous men could have been highlighted a little more initially but there are some stunning solos, duets and ensemble numbers. Jasmin Sheppard is radiant as Patyegarang, dancing with a lithe, gentle, expressive fluidity. A tiny figure next to guest artist Thomas Greenfield who is a strong, striking presence as Dawes, they are gorgeous together. Elma Kris and Waangenga Blanco are also standouts. Jacob Nash’s stark, rugged set, Jennifer Irwin’s costumes and Nick Schlieper’s richly coloured lighting make for a work of stunning visual beauty, while David Page’s score, which combines traditional, classical and electronic music with spoken words, has a mesmerising, pulsing quality. Dawes built up a relationship of trust with the local Aboriginal people. He wanted to stay in Sydney but was ordered home after he defied an order to take part in a punitive expedition against them. Patyegarang’s grief as she lies with his red jacket over her head is here a deeply moving image. Richard Green, a Dharug man who acted as the cultural advisor for the project puts it simply: “Dawes was different, he listened.” Patyegarang intimates what might have been had there been more people like him. A beautiful work. Patyegarang plays in Sydney until July 5 then Canberra July 17 – 19, Perth July 30 – August 2, Brisbane August 15 – 23 and Melbourne August 28 – September 6.